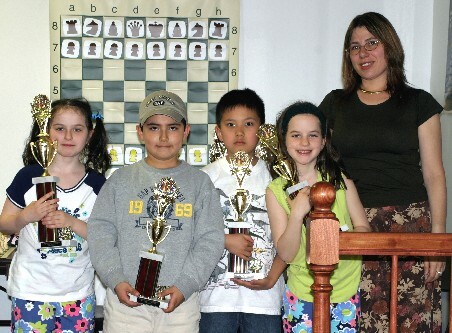 By invitation of Susan Polgar Chess Club (New York, NY), on April 18 2004 our students Dina and Esther Shimanoviches played in Polgar Chess Club Scholastic Tournament in K-4 section. Both sisters won 3 games of 4. This high result allowed them to share 1st place. Esther and Dina were awarded with 1st place trophies and also with the prize for Top Girl result - ExcaLibur Hand Help Electronic Chess computer!